I saw these tree globes at the beginning of the season and I thought they were so cute and would make sweet little gifts to those people you don't know what on earth to get them. I also thought there's no way I am paying $28.00 for one when I know I can make that myself! 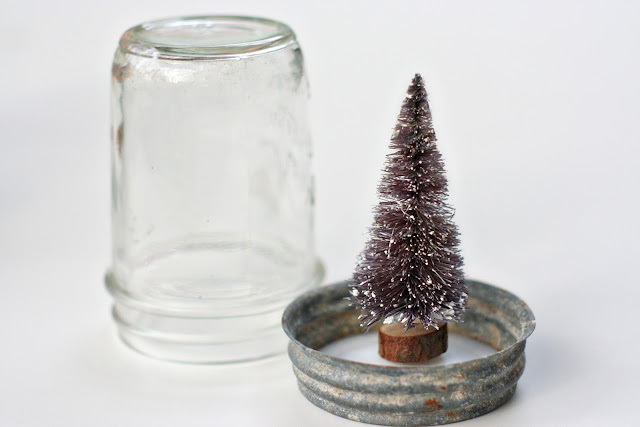 I made these ones for about $10 each which is a splurge because I bought really lovely antique mason jars and trees - I know they could be made for much less. I also bought a giant bag of "snow" because apparently they only sell giant bags of fake snow. But for my two dollars I am fairly certain I can make snow globes every year for the rest of my life, or I can mail you some (seriously I would; though if you think glitter is bad it has nothing on fake snow). 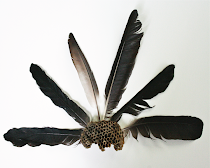 So this is about as easy of a DIY as you can get and that's what I am into, simple diys. It took me all of about 1 minute to make these ones. 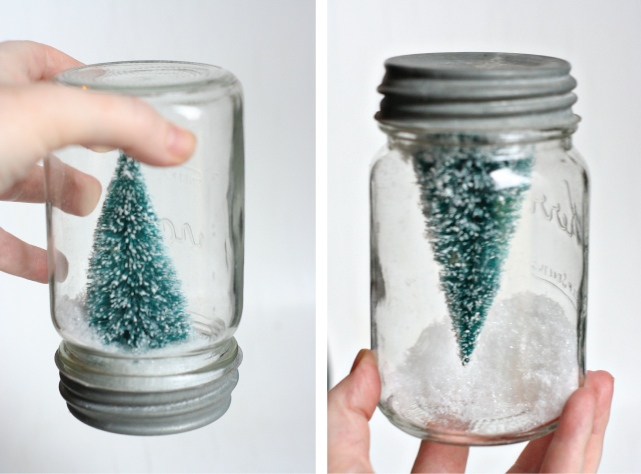 What you need is a mason jar, glue gun or other glue substance that will hold strong, a bottle brush tree, and some fake snow. And all you do is glue your tree to the lid, add snow and screw on lid. Twenty-eight dollars, hahahaha. I love bottle brush trees, and I've so been wanting to make something with them! Where did you buy them?! I also love those jar lids! Such a great DIY! Cute,cute, cute and lovely great DIY!! I like it!It's a great idea for a present!I made a lot of them last year!!! Oh these are adorable. I can't wait to make some! So sweet, and super smart to make them yourself! I love the jars, especially and their minimal beauty. Twenty eight bucks?! What a rip off! Good for you for DIYing these. I had a humongous collection of snowglobes when I was a kid. Whenever we went on a trip anywhere I would pick one up. I wonder if my mom still has them somewhere in the house. There were like, 50, I swear. They were all plastic so obviously not as antique or hand-made as this, but still! Do the wee ones like them? Cristine I love bottle brush trees,Wonderful little project!!! I too saw these at Anthro and thought they would make a perfect gift! 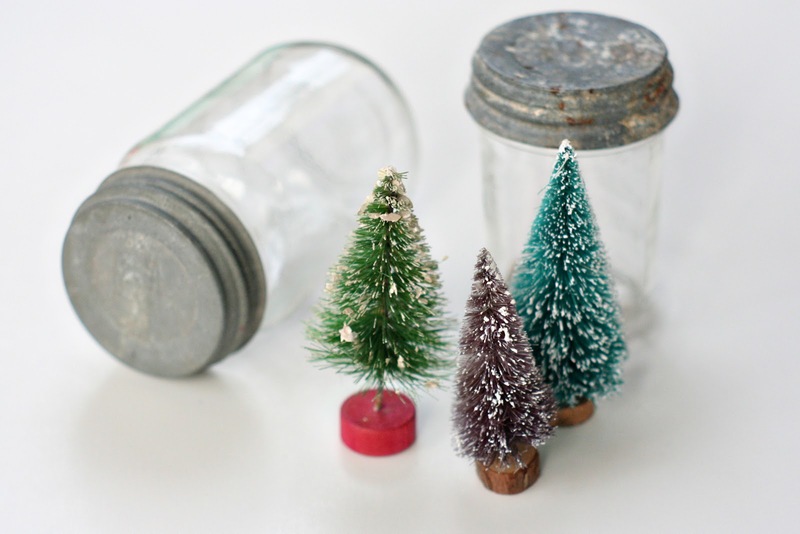 I'm glad you "splurged" for the antique-y jars and trees because they are so cute and look the same! I've seen those all over interest, can't wait to make them. It needs to be this Christmas, too many DIY's put off! These are so cute and I kind of love them upside down too! Love it! The antique mason jars really make the whole thing, as they give it extra character. Great job! Oh, I love. 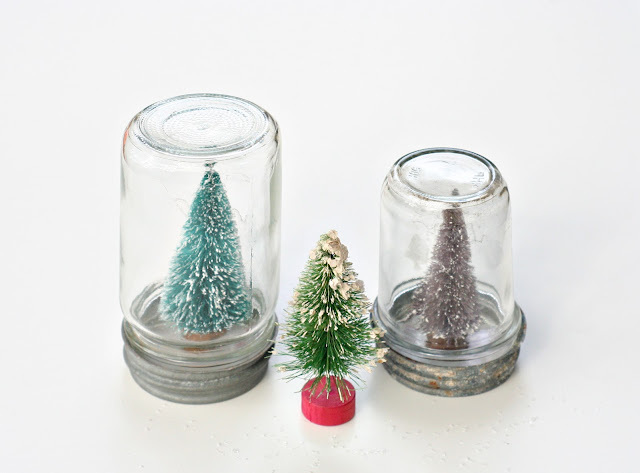 I think what makes these extra special is the vintage mason jars and trees; Good call. Now, put these on Etsy and sell them for $28. ha! They look so cute! A great gift idea too.